Yucca flowers; photo by DM on Flickr (use permitted with attribution / no derivative works). The yucca flower was selected by the schoolchildren of New Mexico and was recommended by the New Mexico Federation of Women's Clubs. The legislation does not specify a particular species of yucca (yucca consists of 40-50 species of perennials, shrubs, and trees native to the hot and dry parts of North America, Central America, and the West Indies). Seeing these lovely flowers in abundance on the plains and deserts of New Mexico, early settlers called them “our Lord’s candles.” The roots of yucca glauca (or soapweed yucca) were also found to be an excellent substitute for soap and shampoo, as was yucca elata (commonly called "soaptree yucca"). Yuccas have a unique, specialized pollination system. 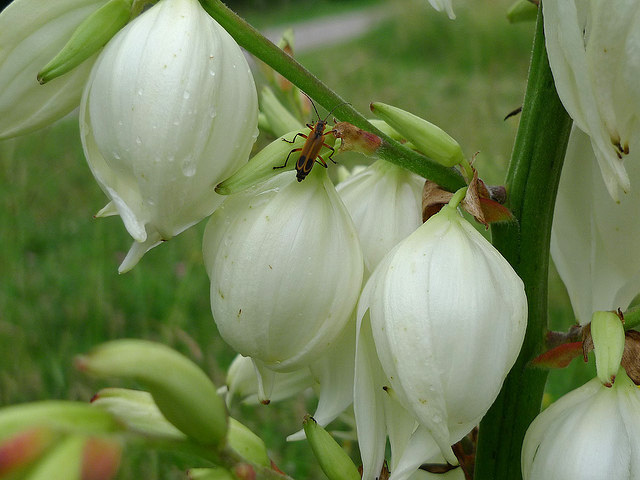 They are pollinated by the yucca moth, which carefully and deliberately transfers the pollen from the stamens of one plant to the stigma of another, and at the same time lays an egg in the flower. The moth larvae then consumes a small amount of the developing seeds. Many yuccas have edible parts, including fruits, seeds, flowers, stems, and sometimes the roots. Dried yucca wood has the lowest ignition temperature of any wood, which makes it desirable for starting fires. 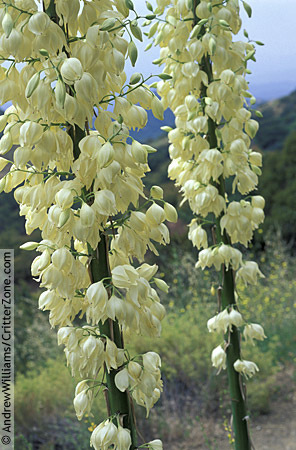 Yucca blossoms; photo © Andy Williams / CritterZone: Animal - Wildlife - Nature Stock Photography (all rights reserved; used by permission). 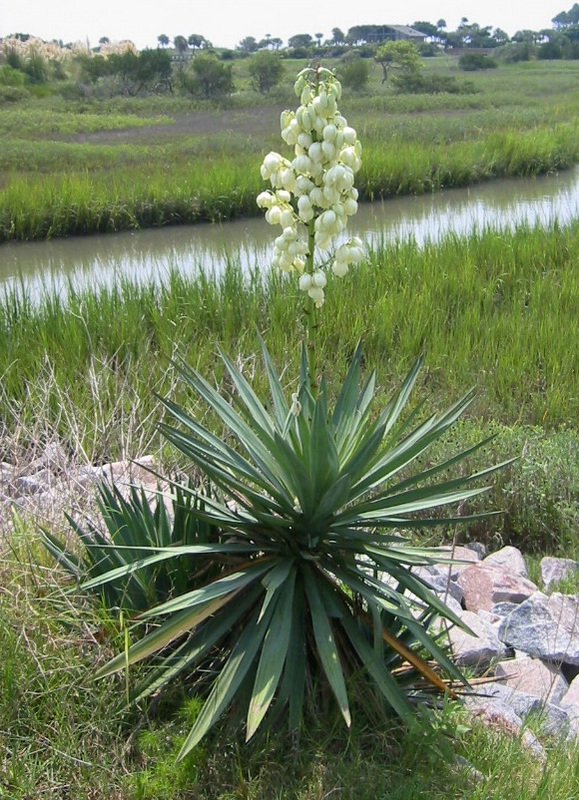 Flowering yucca plant; photo by terren in Virginia on Flickr (use permitted with attribution).